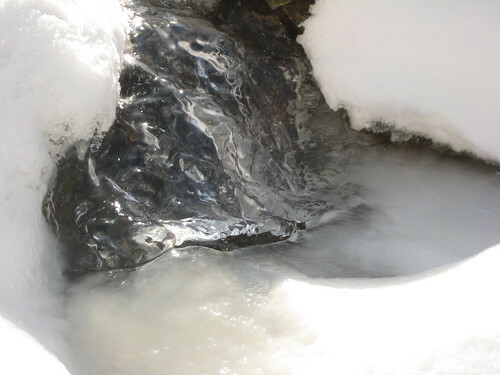 The cold weather continues: the bottom of the biofalls has frozen over, and the water rushes down the inside face of the ice cave that has formed. 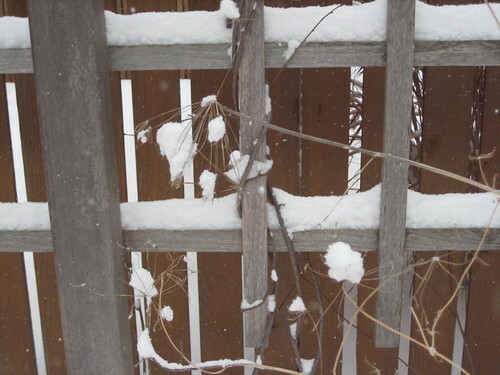 Unlike last year, we don’t appear to have any problems yet with ice dams – the water level remains good. The top of the biofalls remains open, and there are lots of animal tracks leading up there. 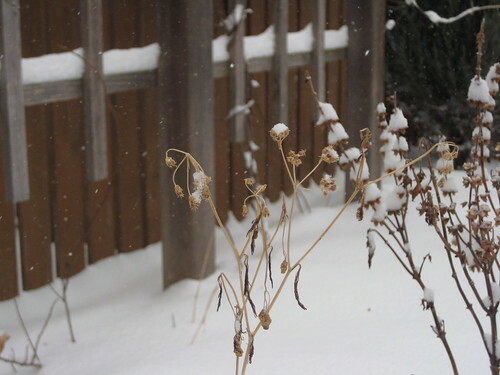 We may getting another cold spell this weekend (albeit not going below 0 F), but at least winter should be half-over by now. I really did enjoy its getting above freezing for a day. 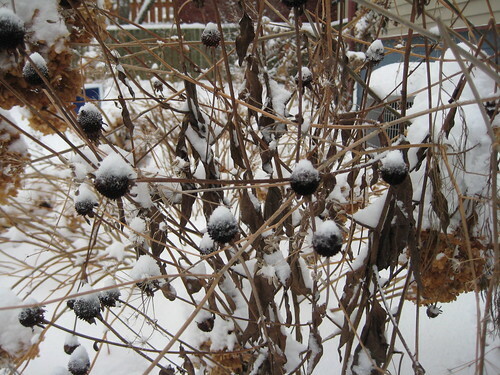 Even though the shortest day of the year was nearly 3 weeks ago, there’s still lots of winter to go. 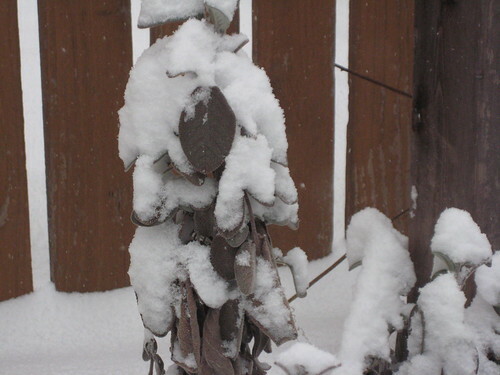 Tom Skilling’s weather blog points out that we’re only 33% through this season’s snowfall and 34% of the way through sub-zero (Farenheit) temperatures. I will have to console myself with the thought that not only are the days now getting over a minute longer each day, but that the cloudiest months of the year are behind us. Why yes, it is dim and gray in Chicago. 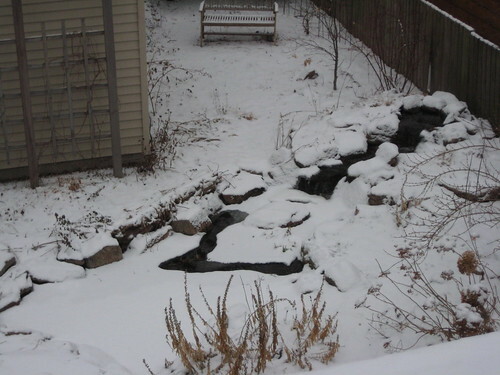 But the pond is still pretty (and we haven’t had to use the deicer yet – good thing since we need to buy a new one). 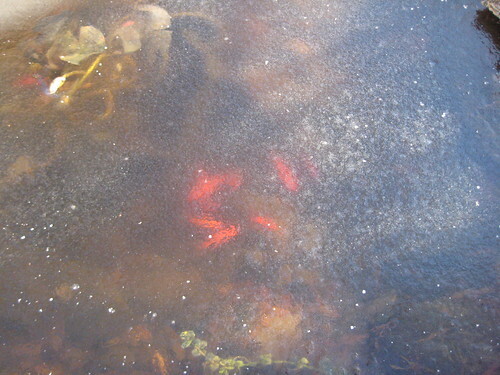 The pond is covered in ice, and the goldfish are barely moving in the cold water. I think the Winter Classic should have had some fish under the ice for that real “pond hockey” feel. 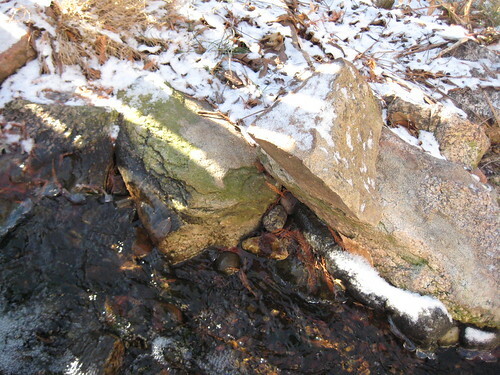 The stream and waterfall are still open, although I haven’t seen a lot of bird or other animal visitors to it lately. 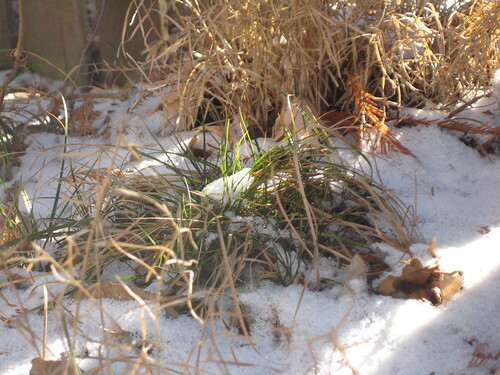 The Pennsylvania sedge fights through a light snowfall to get the faint wintertime sunlight.